Thinking of having something awesome for lunch? How about delicious and filling mushroom burgers! These no potato burgers are light, healthy and oh so yummy. 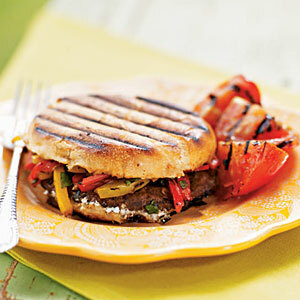 Bell peppers, cheese and vinegar give them an energetic kick; must have for mushroom lovers. Slice them into halves or quarters and serve as unique party appetizers. Combine the vinegar, olive oil and garlic cloves in a large bowl. Add the bell peppers and mushrooms to this dressing and coat them nicely. When done, remove them from the dressing and keep aside. Coat the grill pan lightly with cooking spray and keep the dressed vegetables on it on medium-high heat. Cook for 3 – 4 minutes on each side or until they are tender. When done, remove from the grill and let them cool down slightly. After that, cut the bell peppers into thin strips. Mix basil, salt and black pepper in a bowl and add the bell pepper strips to this. Mix nicely. Cut the burger buns in half horizontally. Spread the soft cheese smoothly over the cut side of the buns. Place one mushroom cap on the bottom half of each sliced bun and top that with around 1/3rd cup of the pepper strips mixture. Cover with the other half. Coat the grill pan slightly with cooking spray and place the burgers on it. Press them lightly with a heavy iron object. Grill for 3 minutes or until the burgers are toasted. When done, remove from the grill, slice into half or quarters if desired. Serve hot!